Preparing your home for winter? If so, look into your windows in St. Louis as they play a crucial part in keeping you and your family warm for the coldest season of the year. The main idea is to keep the heat in and the cold out. Dysfunctional windows will allow the chilly air to come in. This will not only foster discomfort; this could also compel your heaters to overwork, and could cause a rise in your energy bill. What you can do is to make sure that your windows are properly sealed and insulated. Check the weatherstripping and make sure that nothing is missing or worn out. Also, inspect the caulk around the windows. If the caulk is cracking, remove the old caulking and reapply a fresh one. Doing this will seal the small openings and gaps in your windows, and keep the cold out and the warm air inside your home. 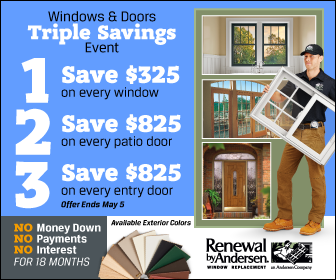 Renewal by Andersen®, the top contractor for home remodeling in St. Louis MO, offers the best replacement windows available on the market today. Our windows are designed and built to feature the combination of durability, elegance, and energy efficiency to create a better home for our customers. Our beautiful and energy-efficient windows are ENERGY STAR-rated, which means that Renewal by Andersen windows provide outst anding insulation to help your household cut down on your utility bills, especially during the coldest season of the year. This is because all of our products are made from the revolutionary Fibrex® material and High-Performance™ Low-E4® glass – the ideal combination in retaining the heat inside your home and keeping the cold air outside. So if you want to make sure that you and your family will enjoy this winter and the winters to come at home in warmth, invest on Renewal by Andersen windows. We have a range of window styles that you can choose from—all beautifully crafted and energy-efficient. Just give us a call to get a free estimate on your windows.